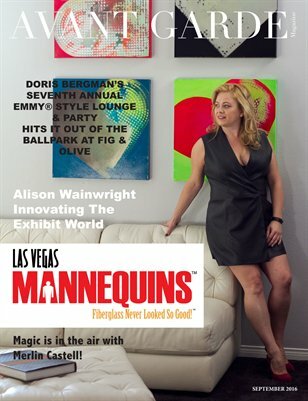 Avant Garde Magazine September Issue 2016 Cover and Feature Alison Wainwright Innovating The Exhibit World, Las Vegas Mannequins. Catching The Last Wave Of Summer. Premier Of Mechanic Resurrection. Metropolitan Fashion Week. One Love Experience. The Lifestyler by John Michael Capalid. Theo Doro Featured In Avant Garde Trunk Sale. Magic Is In The Air With Merlin Castell. Doris Bergman's Seventh Annual Emmy Style Lounge & Party At Fig & Olive.